Objectives: The objective was to examine the association between non-Hodgkin's lymphoma (NHL) and farming-related activities, gender, pesticides exposure, and exposure to chemicals other than pesticides in Saskatchewan. Materials and Methods: Male and female study participants were taken from two separate case-control studies conducted in Saskatchewan province, Canada. A case was defined as any man or woman aged 19 years and older with a first diagnosis of NHL registered by the Saskatchewan Cancer Agency during the study period. Conditional logistic regression was used to fit the statistical models. Results: Farming exposure and exposure to pesticides-contaminated cloths were related to an increased risk of NHL. Exposure to pesticides was strongly associated with an increased risk of NHL, especially for men. Conclusion: For men, the incidence of NHL was associated with exposure to pesticides after adjusting for other independent predictors. (7.9% of total population) and 72,925 (7.4% of total population) farmers in Saskatchewan in 1991 and 1996, respectively. Agricultural census reports the percentage of people who used pesticides in the year before the census year. In 1986, 1991, and 1996, 82.7, 74.9, and 74.7% of farmers reported using herbicides, insecticides, or fungicides, respectively. Therefore, there was a greater chance for exposure to pesticides at work or home for farmers and their spouses. In this paper, we examined the association between NHL and farming-related activities, gender, pesticides exposure, and exposure to chemicals other than pesticides in Saskatchewan. Study participants included males and females from two separate case-control studies (Study I and Study II) conducted in Saskatchewan province, Canada. The Study I (named as the Cross-Canada Study of Pesticides and Health) was a matched, population-based, case-control study of men residing in six Canadian provinces (Quebec, Ontario, Manitoba, Saskatchewan, Alberta, and British Columbia) to test whether there were associations between pesticide exposure and four rare tumors: multiple myeloma, Hodgkin's lymphoma, NHL, and soft tissue sarcoma. , The Study II was another matched case-control study conducted in Saskatchewan to explore the possibility of a relationship between the incidence of certain types of cancer (soft tissue sarcoma, NHL, multiple myeloma, and brain gliomas) in women and farm residence, farm practices, and pesticide exposure. We combined the two case-control studies male and female NHL cases and all controls from Saskatchewan to compare incidence of NHL between males and females to accomplish the objective of this manuscript [Figure 1]. Male study participants were taken from the Saskatchewan portion of the Study I. Female study participants were taken from the Study II [Figure 1]. For males and females, case-control study design with a mailed questionnaire was used. A female case was defined as any woman over the age of 19 years with a first diagnosis of NHL [International Classification of Diseases, version 9 (ICD-9), code 200 or 202] registered by the Saskatchewan Cancer Agency (previously known as Saskatchewan Cancer Foundation) between November 1, 1989 and December 31, 1991. A male case was defined as any man over the age of 19 years with a first diagnosis of NHL (ICD-9 code 200 or 202) registered by the Saskatchewan Cancer Agency between September 1, 1991 and December 31, 1994. The control subjects were aged 19 years or older, were residents of Saskatchewan, and were free of NHL; they were selected at random from the health-covered population as represented by the provincial health services records. The province of Saskatchewan has provincial health insurance, which covers all members of the population with few exceptions. Health care for members of the Armed Forces and for Status Indians is a federal government responsibility. 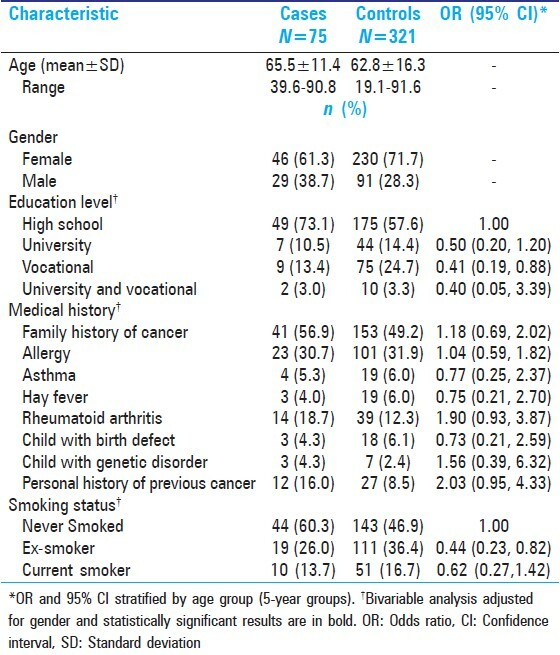 In Study I (Cross-Canada Pesticides and Health Study), control subjects were matched by age ± 2 years to be comparable with the age distribution of the entire case group (soft tissue sarcoma, Hodgkin's lymphoma, NHL, and multiple myeloma) within Saskatchewan. In Study II (a case-control study of female Saskatchewan residents), control subjects were matched by age ± 2 years to be comparable with the age distribution of the entire case group (soft tissue sarcoma, NHL, brain gliomas, and multiple myeloma) within Saskatchewan. All participating control subjects were used in the statistical analysis. Three control subjects per male case and five control subjects per female case were used in the statistical analysis [Figure 1]. Both studies (Study I and II) were described to the participants as a research on pesticide exposure and health. The postal questionnaire captured the following variables: demographic data, medical history, smoking patterns, family medical history with an emphasis on cancer in first-degree relatives, detailed lifetime occupation and occupational exposure history, and pesticide use at home, in the garden, or at work. Subgroups that had lived or worked on farms were asked general questions concerning the use of gloves, masks, or protective clothing while mixing or applying pesticides, storing pesticides, and using pesticide-contaminated cloths. Data were entered using the Statistical Package for the Social Sciences (SPSS) data entry program. The data from the postal questionnaires were used for the statistical analysis. Statistical analysis followed the procedures suggested by Breslow et al. We used Statistical Analysis System (SAS)  computer software to conduct the analyses. We conducted descriptive analyses of each variable, which included, where applicable, frequencies and mean ± standard deviation (SD) for cases and controls separately. A series of conditional logistic regression models were fitted, stratified by age groups, and adjusted for gender to determine whether potential risk factors, confounders, and interactive effects contribute significantly to the incidence of NHL. In conditional logistic regression analysis, strata were defined on cross-classifying 5-year intervals of age. Based on bivariable analysis, statistically significant variables with P < 0.20 become candidates for a multivariable model. All variables that were statistically significant (P < 0.05) were retained in the final multivariable model. Results are reported as odds ratios (ORs) and 95% confidence intervals (CIs) derived from conditional logistic regression analyses. From the question "Have you ever been exposed at work to any of the following: 1) dust (cements, fiberglass, coal, whey dust, paper, coke, stone, sand, cardboard, metal), 2) coal products (pitch, asphalt, crude petroleum, tar, or tar products), 3) printing (ink, printing fluids, dyes), 4) paints (paints, dyes), 5) metals (arsenic, nickel, cadmium, zinc, mercury, chromium, iron ore, lead, aluminum), and 6) miscellaneous (asbestos, cutting oils, cleaning fluids, pelt, fur or hide preservatives, chlorine, hair permanent solution, sour gas, wood smoke, solvents, ether, hair dyes, cyanide)", exposure to chemicals other than pesticides six subgroups were derived. Therefore, the duration of the exposure is unknown. All the responses were self-reported. Each subgroup was defined as a positive response to that subgroup of specific occupational exposures. "Exposure to pesticides" was defined as exposure to the following pesticides at work, inside the home, or in the garden: herbicides/weed killers, fertilizers, insecticides/bug killers, potato seed dust, fungicides, slimides, algicide, water treatment, seed treatment, fruit tree spray, fumigants, wood preservatives, pruning paints, and adjuvants. "Farm-related industries" were defined as ever having worked at any of the following occupations: grain, mixed, beef, hog, chickens, sheep, small animal, market garden, orchards, dairy, and egg production. This study includes responses from 75 cases with NHL and 321 control subjects [Figure 1]. The mean age ± SD of cases was 65.5 ± 11.4 years and of the controls, 62.8 ± 16.3 years. More females (n = 276, 69.5%) than males (n = 120, 30.5%) were in the two combined studies. Seventy-four percent of males had lived on a farm compared with 63% of females. There were 33% of males involved in current farming compared with 14% of females. There were no significant differences between NHL cases and controls with respect to personal medical history. Ex-smokers reported a lower risk of NHL compared with non-smokers (OR = 0.44, 95% CI: 0.23, 0.82). The risk of NHL decreased with the level of education, and the level of technical, trade, or vocational training after high school shows a significant lower risk of NHL (OR = 0.41, 95% CI: 0.19, 0.88). Results are shown in [Table 1]. [Table 2] shows bivariable analysis adjusted for gender of farming and occupational history of the cases and the controls. The following occupational histories were significantly related to an increased risk of NHL: currently living on a farm (OR = 2.38, 95% CI: 1.09, 5.17), lived or worked on a farm for more than 30 years (OR = 2.43, 95% CI: 1.15, 5.11), and ever worked in farming-related industries (OR = 1.82, 95% CI: 1.06, 3.12). [Table 3] shows the results of multivariable conditional logistic regression models for pesticides exposure and risk of NHL stratified by age groups. Ex-smokers had a significantly lower risk of NHL (OR = 0.48, 95% CI: 0.25, 0.90). The relationship between NHL and pesticides was modified by gender. Males who were exposed to pesticides were three times more likely to report NHL (OR = 3.08, 95% CI: 1.26, 7.53). Two subanalyses were conducted to explore the findings observed. First subanalysis of data was to explore the effect of pesticide exposure type (home versus work). The exposure to pesticides was calculated taking into account the home or garden exposure and at work exposure. One of the limitation was that we do not have enough sample size to consider the home or garden and occupationally on the farm separately in this analysis. The exposure patterns and duration of exposure were significantly different in these two occasions (home versus work). A subanalysis of our data showed that there was a significantly higher proportion (P < 0.0001) of males (36.7%) exposed to pesticides at work compared with females (0.4%). There was no significant difference (P = 0.76) in proportion of females (36.6%) exposed to pesticides around the home or garden compared with males (35.0%). 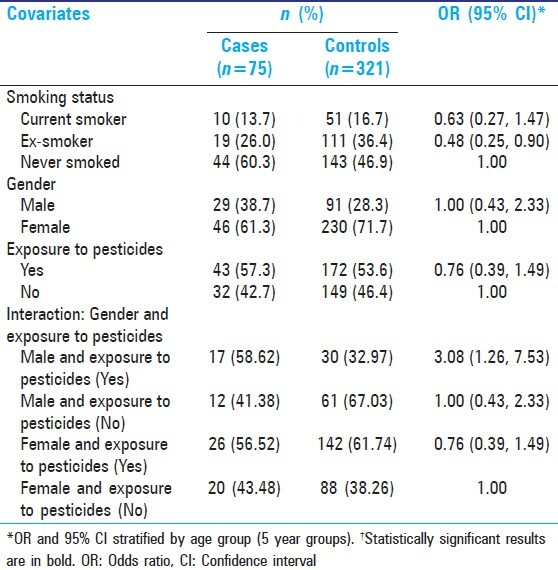 More male cases (41.4%) were exposed to pesticides at work compared with female cases (2.2%) [Table 4] (P < 0.0001). There was no significant difference in proportion of female cases (41.3%) exposed at home compared with male cases (34.5%) [Table 4] (P = 0.55); male and female controls were equally exposed at home [Table 4] (P = 0.94). Overall, more cases (17.3%) were exposed to pesticides at work compared with controls (10%) (P = 0.07). Second subanalysis was carried out only for individuals who had ever lived or worked on a farm, regarding occupational hygiene issues [Table 5]. There were 57 cases and 202 controls, which had ever lived or worked on a farm. There were significantly increasing risks of NHL in those who had worked with storage (OR = 2.78, 95% CI: 1.16, 6.63) and handling (OR = 2.26, 95% CI: 1.00, 5.18) of pesticide-contaminated clothing at home. Among well water drinkers on the farm, there was an increased risk of NHL among shallow well water users (OR = 2.15, 95% CI: 1.03, 4.49) compared with deep well water users [Table 5]. Exposure to pesticides was strongly associated with an increased risk of NHL, especially for men. Exposure to chemicals other than pesticides was also related to an increased risk of NHL. 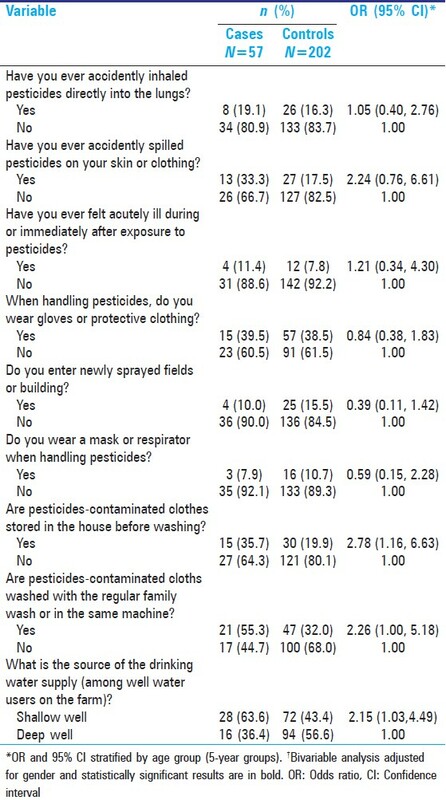 Individuals who had ever lived or worked on a farm, who had worked with the storage and handling of pesticide-contaminated clothing in the home had a significantly increasing risk of NHL. In this study, more males had lived or worked on a farm or were currently farming than females. Within the group of participants who were farming, females faced exposure to pesticide-contaminated clothing in the home. Similar to these findings, many other studies reported association between pesticide exposure and the increased risk of NHL. Several papers from the Agricultural Health Study (AHS), a large prospective cohort of licensed pesticides applicators and their spouses reported that non-Hodgkin's risk among farmers was associated with the use of the specific pesticides (insecticides: carbaryl, , lindane, , and terbufos  and herbicides: metolachlor  and butylate  ). A previous analysis based on AHS data found a suggestive association between atrazine herbicide and NHL,  whereas a recent report from AHS presented that there was little evidence for association between NHL and atrazine. The Cross-Canada Study of Pesticides and Health (Study I) reported that NHL risk among Canadian individuals was associated with the use of specific pesticides 2-4 dichlorophenoxyacetic acid, mecoprop, dicamba, malathion, dichlorodiphenyltrichloroethane (DDT), carbrayl, aldrin, and lindane. A recent French study reported that the specific pesticides organophosphate, carbamate, and triazole were associated with an increased risk of the NHL subtype follicular lymphoma. A recent paper from the Cross-Canada Study of Pesticides and Health (Study I) reported that the risk of NHL increased with the number of pesticides used, as well as with the use of malathion in combination with several other pesticides. Based on the AHS,  it has been reported recently that the rate of death from NHL was significantly evaluated among pesticide applicators (relative standardized mortality ratio (rSMR) = 1.57, 95% CI: 1.27, 1.93) and their spouses (rSMR = 2.15, 95% CI: 1.58, 2.93), relative to all other causes of death (rSMR) during 1993 to 2007. A recent Swedish case-control study  of males and females confirmed the association between exposure to pesticides (herbicides and insecticides) and risk of NHL. Similar to these reports our study reported that men exposed to pesticides were more likely to be at increased risk of incidence of NHL as compared with those men and women not exposed to pesticides. We observed that the exposure patterns were significantly different at home/garden and at work. More male cases were exposed to pesticides at work compared with females. There was no difference in proportions of pesticides exposure at home or garden among males and females for both cases and controls. A retrospective case-control study of women reported that a higher risk of NHL was associated with exposure to pesticides, and women who used pesticides at home had a higher chance of developing NHL than women who never used such products at home. Also, NHL risk was 2.1 times greater among women who had worked at least 10 years on a farm where pesticides were used compared with women who had never worked on a farm. Similar to this, our study reported that individuals who lived or worked on farms for at least 30 years faced a 2.4 times higher risk of developing NHL compared with individuals who had never lived or worked on a farm. A population-based case-control study  reported that agricultural workers and framers had elevated risk of NHL. Also authors reported the elevated risk of NHL among those exposed to chlorophenols, herbicides, and arsenic compounds and occupational exposure to chemicals other than pesticides (asbestos, chromium, diesel fuel, organic and inorganic dust, tar and mineral oil, and contact with livestock) compared with individuals who did not have such exposures. Our results also reported that those who ever worked in farming-related industries including livestock had an increased risk of NHL. We could not report separate analysis for each exposure due to small sample size. There was a greater risk of NHL associated with drinking water from shallow wells as compared with deep wells on the farm. The shallow wells were more prone to pesticides contamination. A study by Witmans et al.,  reported that water taken from homes of NHL cases contained a significantly higher concentration of 14 chemical elements and that some of these elements may be active ingredients in pesticides that have been associated with NHL. In our study, both men and women together who were exposed to pesticides-contaminated clothing at home before washing and who had pesticides-contaminated cloths washed with the regular family wash or in the same machine had a significantly increasing risk of NHL. Engaging in field work such as applying pesticides, applying pesticides in fields close to their home, or mix or load pesticides in proximity to their drinking water wells and contaminated personal items could increase risk of exposure to pesticides among farmer's wives. Authors also reported that wearing of work boots inside the home and mixing pesticides-contaminated clothing with the family washing were up to 1.5 times more likely among the heaviest pesticides users compared with non-users. A separate analysis of our data obtained from the Study II for females confirmed that there was a 3.27 (95% CI: 1.06, 10.09) times risk of NHL among females, if pesticides-contaminated cloths stored in the home before washing indicating gender is an effect modifier. Therefore, household hygiene practices could help to reduce the pesticides exposure in women. One of the major limitations of this study was the unreliable information on specific pesticides exposure for women available for analysis. For men, detailed pesticides exposure was available and results were published in McDuffie et al. Another limitation of this study was the potential recall bias and misclassification of pesticide exposure. For the women included in the study, we did not have all of the medical history variables available. Finally, this analysis was based on self-reported questionnaire data. We have included individuals in many different occupations as well as home and garden users. This study was not only restricted to pesticides exposure but also included chemicals other than pesticides and radiation exposure. This analysis confirmed that the men who were exposed to pesticides were at greater risk of developing NHL. To confirm the associations with women, additional studies are needed with details of the role of exposure, the dose, and the duration of exposure. Special thanks go to the late Dr. H. H. McDuffie and the Cross-Canada Pesticides and Health Study Team (Drs. J. J. Spinelli, J. R. McLaughlin, P. Pahwa, J.A. Dosman, G.Theriault, D. Robson, S. Fincham, and D. White, and late Drs. N.W. Choi, L. Skinnider, and H. H. McDuffie). The authors sincerely thank each of the study participants who gave freely their time and shared personal details with the authors and the organizations who permitted access to their records. 1. McDuffie HH, Pahwa P, Robson D, Dosman JA, Fincham S, Spinelli JJ, et al. Insect repellents, phenoxyherbicide exposure, and non-Hodgkin's lymphoma. J Occup Environ Med 2005;47:806-16. 2. McDuffie HH, Pahwa P, McLaughlin JR, Spinelli JJ, Fincham S, Dosman JA, et al. Non-Hodgkin's lymphoma and specific pesticides exposures in men: Cross-canada study of pesticides and health. Cancer Epidemiol Biomarkers Prev 2001;10:1155-63. 3. Hardell L, Eriksson M. A case-control study of non-Hodgkin lymphoma and exposure to pesticides. Cancer 1999;85:1353-60. 4. Hohenadel K, Harris SA, McLaughlin JR, Pahwa P, Dosman JA, Demers PA, et al. Exposure to multiple pesticides and risk of non-Hodgkin lymphoma in men from six canadian provinces. Int J Environ Res Public Health 2011;8:2320-30. 5. Karunanayake CP, McDuffie HH, Dosman JA, Spinelli JJ, Pahwa P. Occupational exposures and non-Hodgkin's lymphoma: Canadian case-control study. Environ Health 2008;7:44. Available from: http://www.ehjournal.net/content/7/1/44 [Last accessed date on March 5, 2013]. 6. McDuffie HH, Pahwa P, Spinelli JJ, McLaughlin JR, Fincham S, Robson D, et al. Canadian male farm residents, pesticide safety handling practices, exposure to animals and Non-Hodgkin's lymphoma. Am J Ind M 2002;42(Suppl 2):54-61. 7. Pearce N, McLean D. Agricultural exposures and non-Hodgkin's lymphoma. Scand J Work Environ Health 2005;31(Suppl 1):18-25. 8. Svec MA, Ward MH, Dosemeci M, Checkoway H, De Roos AJ. Risk of lymphatic or haematopoietic cancer mortality with occupational exposure to animals or the public. Occup Environ Med 2005;62:726-35. 9. Mills PK, Yang R, Riordan D. Lymphohematopoietic cancers in the United Farm Workers of America, 1988-2001. Cancer Causes Control 2005;16:823-30. 10. Blair A, Linos A, Stewart PA, Burmeister LF, Glbson R, Everett G, et al. Evaluation of risks for non-Hodgkin's lymphoma by occupation and industry exposures from a case-control study. Am J Ind Med 1993;23:301-12. 11. Amadori D, Nanni O, Falcini F, Saragoni A, Tison V, Callea A, et al. Chronic lymphocytic leukaemias and Non-Hodgkin's lymphomas by histological type in farming-animal breeding workers: A population case-control study based on job titles. Occup Environ Med 1995;52:374-9. 12. Zheng T, Blair A, Zhang Y, Weisenburger DD, Zahm SH. Occupation and risk of non-Hodgkin's lymphoma and chronic lymphocytic leukemia. J Occup Environ Med 2002;44:469-74. 13. Persson B. Occupational exposure and malignant lymphoma . Int J Occup Med Environ Health 1996;9:309-21. 14. Pollán M, López-Abente G, Moreno C, Vergara A, Aragonés N, Ruiz M, et al. Rising incidence of non-Hodgkin's lymphoma in Spain: Analysis of period of diagnosis and cohort effects. Cancer Epidemiol Biomarkers Prev 1998;7:621-5. 15. Hertzman C, Teschke K, Ostry A, Hershler R, Dimich-Ward H, Kelly S, et al. Mortality and cancer incidence among sawmill workers exposed to chlorophenate wood preservatives. Am J Public Health 1997;87:71-9. 16. Persson B, Fredriksson M. Some risk factors for Non-Hodgkin's Lymphoma. Int J Occup Med Environ Health 1999;12:135-42. 17. Clapp RW, Jacobs MM, Loechler EL. Enviornmental and occupational causes of cancer: New evidence 2005-2007. Rev Environ Health 2008;23:1-37. 18. McDuffie HH, Pahwa P, Karunanayake CP, Spinelli JJ, Dosman JA. Clustering of cancer among families of cases with Hodgkin Lymphoma , Multiple Myeloma, Non-Hodgkin's Lymphoma, Soft Tissue Sarcoma and controls subjects. BMC Cancer 2009;9:70. Available from: http://www.biomedcentral.com/1471-2407/9/70 [Last accessed date on April 10, 2013]. 19. Miligi L, Costantini AS, Veraldi A, Benvenuti A. WILL. Vineis P. Cancer and Pesticides: An overview and some results of the Italian multicenter case-control study on hematolymphopoietic malignancies. Ann N Y Acad Sci 2006;1076:366-77. 20. Orsi L, Monnereau A, Dananche B, Berthou C, Fenaux P, Marit G, et al. Occupational exposure to organic solvents and lymphoid neoplasms in men: Results of a French case-control study. Occup Environ Med 2010;67:664-72. 21. McDuffie HH. Women at work: Agricultural and pesticides. J Occup Med 1994;36:1240-6. 22. McDuffie HH, Towstego L, Pahwa P. Similarities and differences among men and women with non-Hodgkin's lymphoma or multiple myeloma. In: McDufie HH, Dosman JA, Semchuk K, Olenchock S, Senthilselvan A, editors. Supplement to Agricultural Health and Safety: Workplace Environment, Sustainability. Saskatoon: University of Saskatchewan Press; 1994. p. 83-91. 23. McDuffie HH, Pahwa P, White DF. 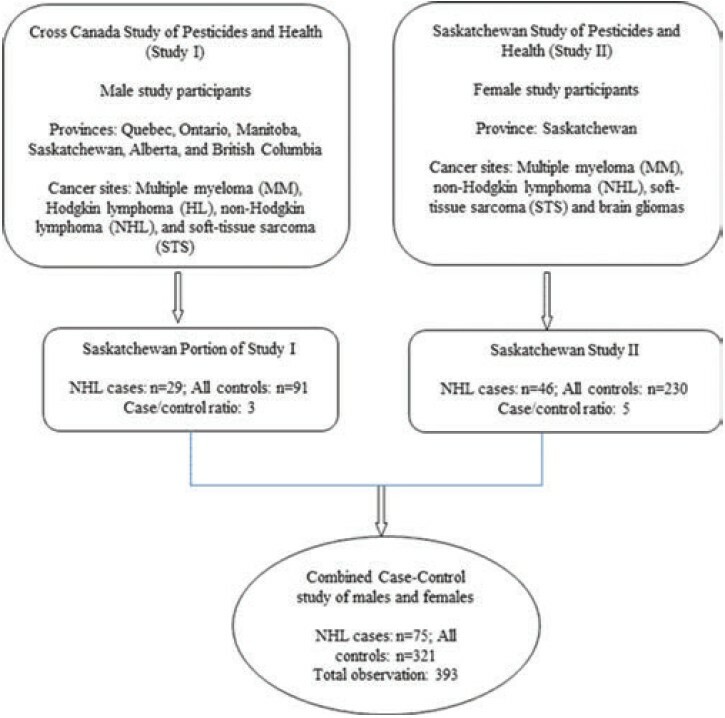 Saskatchewan women and agricultural exposures: Any relationship to tumor incidence? In: McDufie HH, Dosman JA, Semchuk K, Olenchock S, Senthilselvan A, editors. Agricultural Health and Safety: Workplace Environment, Sustainability. Boca Raton, Florida: CRC Press, Inc.; 1995. p. 135-142. 24. Zahm SH, Weisenburger DD, Saal RC, Vaught JB, Babbitt PA, Blair A. The role of agricultural pesticide use in the development of non-Hodgkin's lymphoma in women. Arch Environ Health 1993;48:353-8. 25. Tenenbaum DJ. The monster in the closet-mathball' link to non-Hodgkin lymphoma. Environ Health Perspect 2004;112:A758. 26. Ward MH, Zahm SH, Weisenburger DD, Cantor KP, Saal RC, Blair A. Diet and drinking water source: Association with non-Hodgkin's lymphoma in eastern Nebraska. In: McDufie HH, Dosman JA, Semchuk K, Olenchock S, Senthilselvan A, editors. Agricultural Health and Safety: Workplace Environment, Sustainability. Boca Raton, Florida: CRC Press, Inc.; 1995. p. 143-150. 27. Vineis P, Faggiano F, Tedeschi M, Ciccone G. Incidence rates of lymphomas and soft tissue sarcomas and environmental measurements of phenoxy herbicides. J Natl Cancer Inst 1991;83:362-3. 28. Hoffmann W, Terchueren C, Heimpel H, Feller A, Butte W, Hostrup O, et al. Population-based research on occupational and environmental factors for leukemia and non-Hodgkin's lymphoma: The Northern Germany Leukemia and Lymphoma Study. Am J Ind Med 2008;51:246-57. 29. Canadian Cancer Society's Steering Committee on Cancer Statistics. Canadian Cancer Statistics 2011. Toronto, ON: Canadian Cancer Society; 2011. 30. Statistics Canada: Census of Agriculture. Selected Historical Data from the Census of Agriculture. Statistics Canada, Catalogue # 95-632-XWE; 2007. 31. SPSS-Data Entry II® Statistical Packages for the Social Sciences: Statistical Data Analysis. Chicago: SPSS Inc., 1998. 32. Breslow NE, Day NE. Statistical methods in cancer research. Volume 1: The analysis of case-control studies. Lyon, France: IARC Scientific publication #32; 1980. p. 162- 89. 33. SAS Institute Inc., SAS/STAT Software, Version 9.2, Cary, NC (USA): SAS Institute Inc.; 2010. 34. Mahajan R, Blair A, Coble J, Lynch CF, Hoppin JA, Sandler DP, et al. Carbaryl exposure and incident cancer in the Agricultural Health Study. Int J Cancer 2007;121:1799-805. 35. Blair A, Freeman LB. Epidemiologic studies in agricultural populations: Observations and future directions. J Agromedicine 2009;14:125-31. 36. Purdue MP, Hoppin JA, Blair A, Dosemeci M, Alavanja MC. Occupational exposure to organochlorine insecticides and cancer incidence in the Agricultural Health Study. Int J Cancer 2007;120:642-9. 37. Bonner MR, Williams BA, Rusiecki JA, Blair A, Beane Freeman LE, Hoppin JA, et al. Occupational exposure to terbufos and the incidence of cancer in the Agricultural Health Study. Cancer Causes Control 2010;21:871-7. 38. Rusiecki JA, Hou L, Lee WJ, Blair A, Dosemeci M, Lubin JH, et al. Cancer incidence among pesticide applicators exposed to metolachlor in the Agricultural Health Study. Int J Cancer 2006;118:3118-23. 39. Lynch SM, Mahajan R, Beane Freeman LE, Hoppin JA, Alavanja MC. Cancer incidence among pesticide applicators exposed to butylate in the Agricultural Health Study. Environ Res 2009;109:860-8. 40. Rusiecki JA, De Roos A, Lee WJ, Dosemeci M, Lubin JH, Hoppin JA, et al. Cancer incidence among pesticide applicators exposed to atrazine in the Agricultural Health Study. J Natl Cancer Inst 2004;96:1375-82. 41. Freeman LE, Rusiecki JA, Hoppin JA, Lubin JH, Koutros S, Andreotti G, et al. Atrazine and cancer incidence among pesticide applicators in the agricultural health study (1994-2007). Environ Health Perspect 2011;119:1253-9. 42. Waggoner JK, Kullman GJ, Henneberger PK, Umbach DM, Blair A, Alavanja MC, et al. Mortality in the Agricultural Health Study, 1993-2007. Am J Epidemiol 2011;173:71-83. 43. Eriksson M, Hardell L, Carlberg M, Åkerman M. Pesticide exposure as risk factor for non-Hodgkin lymphoma including histopathological subgroup analysis. Int J Cancer 2008;123:1657-63. 44. Richardson DB, Terschüren C, Hoffmann W. Occupational risk factors for non-Hodgkin's lymphoma: A population-based case-control study in northern Germany. Am J Ind Med 2008;51:258-68. 45. Witmans MR, McDuffie HH, Karunanayake C, Kerrich R, Pahwa H. An exploratory study of chemical elements in drinking water and non-Hodgkin's lymphoma. Toxicol Environ Chem 2008;90:1227-47. 46. Kirrane EF, Hoppin JA, Umbach DM, Samanic C, Sandler DP. Patterns of pesticide use and their determinants among wives of farmer pesticide applicators in the Agricultural Health Study. J Occup Environ Med 2004;46:856-65. 47. Chatterjee N, Hartge P, Cerhan JR, Cozen W, Davis S, Ishibe N, et al. Risk of non-Hodgkin's lymphoma and family history of lymphatic, hematologic, and other cancers. Cancer Epidemiol Biomarkers Prev 2004;13:1415-21. 48. Tavani A, La Vecchia C, Franceschi S, Serraino D, Carbone A. Medical history and risk of Hodgkin's and non-Hodgkin's lymphomas. Eur J Cancer Prev 2000;9:59-64. 49. Melbye M, Smedby KE, Lehtinen T, Rostgaard K, Glimelius B, Munksgaard L, et al. Atopy and risk of non-Hodgkin lymphoma. J Natl Cancer Inst 2007;99:158-66.